GJ Guitar and Mandolin Techniques Very Similar? This past year I've started to get in to Gypsy Jazz. So much that I'm getting back into playing guitar, D'jango-style. Just started, and found that many of the tutorials and books explain the guitar right hand technique (pick grip, wrist motion, "loose fist") and left hand dampening very similar to method book/tutorials on the mandolin. Is this me oversimplifying the two techniques or are there some seasoned GJ guitarists and mando players out there who can weigh in? Are you talking about lead or rhythm? I don't know anything about mando but from what I've seen the right hand technique for lead is nothing like GJ. Rhythm comp is where I see the greatest similarities. Even for lead, I see that the pick grip, the loose wrist, keeping the right hand off the instrument (floating above vs planted anywhere) are very similar. Again, this is from a guy with 5 years on the mandolin and just a couple months attempting GJ guitar. I remember watching Chris Thile give a demonstration and explanation of his technique and if i remember well, there was no reststroke...so I would say...no, it's not the same technique. From what I have seen (not much) mando players tend to pick more like an electric guitar player than a GJ guitar player (i.e. wrist or forearm resting on the bridge) not with a bent wrist and floating hand. Compare this mando to Joscho in this vid. This looks like the way I'm used to seeing mando picking. Vid is kind of jumpy at first but it gets smoother. I think there's probably a world of difference between modern American bluegrass/jazz mandolin playing, and the classical European technique, which, before Django's time, was the only "serious" plectrum technique, and the one all the gypsy kids would have been taught before they hit the cafes. Certainly that's how Django started, and probably the Ferrets and others too. Interesting point. In the US I've never seen that technique on mando (not that I've seen that many players) just kind of bluegrass style I guess. Can you post a youtube link for example? Here is my fav Jethro Burns but I wouldn't really call this similar to GJ guitar. Great Video, Thanks for posting that. I love Jethro Burns. Jethro is joined by Don Stiernberg (mandolin) and John Parrott (guitar). Playing took place 29 years ago, Don Stiernberg, will be at D I J this year. 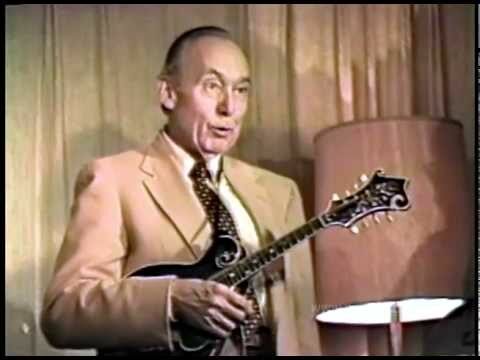 As martin b alluded to, gypsy picking used to be the standard technique for pretty much all plectrum instruments. If you read old mandolin methods they typically advocate playing with an arched wrist, using rest strokes on down strokes and always using a down stroke when changing strings. It's still the standard technique used by a lot of classical mandolinists, especially Germans. 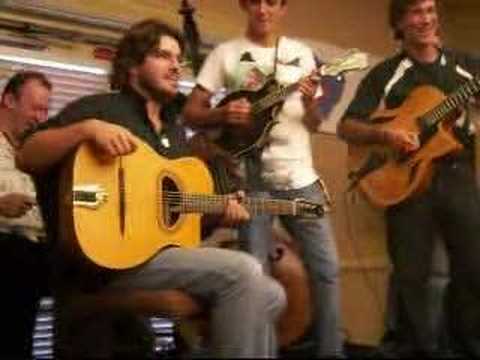 Now that mandolin is part of the folk tradition, technique is all over the place (especially in America). The "standard" pick grip is similar and the left hand muting of chords is the same general idea as gypsy jazz. But most mandolinists use alternate picking (e.g. eighth notes are always played DUDU DUDU), rest strokes are rarely seen, and most players have a flatter wrist and are touching the mandolin somewhere (palm brushing the bridge, fingers brushing or touching the top). Interesting info Peewee. Yes, it seems like most US bluegrass guys use alternate picking. Wim, I always thought oud looked like GJ.